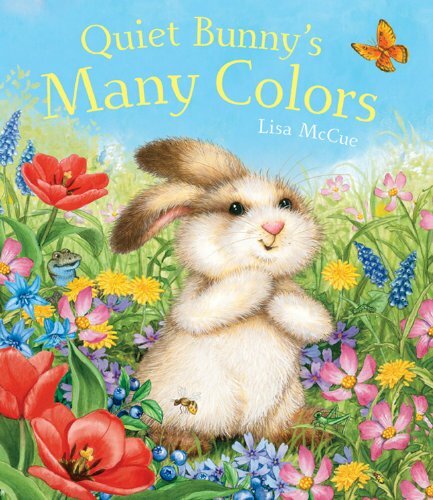 Quiet Bunny's Many Colors by Lisa McCue, Sterling 2010. As with any picture book, the pictures are the first thing you notice. They were, in fact, what drew Mud Pie to the book at the library and compelled her to yank it off the shelf and stuff it in her over-full library bag. Predictably, she oohed and ahhed, "How CUTE!" through the whole thing. I enjoyed it too. A pleasant rhythm as sweet little bunny explores the colors of spring, and comes to appreciate his own unique colors. I would have liked the illustrator McCue to shush the author McCue and let the pictures tell a bit more of the story, but Pie certainly didn't mind. The art is truly lovely, and the story happy, delightful. Question: are blueberries a spring fruit? Not in Michigan, but perhaps elsewhere ... Hmmm.